Today Pune is one of the best known cities of India. It is also known as the cultural capital of Maharashtra. Human dwelling and settlement always bloom adjacent to a river normally. In the same way from time immemorial there was a settlement on the banks of river Mutha. The river Mutha confluences with Mula River and the settlement on the right bank of Mutha is the seeding or beginning of the present day Pune. This settlement area is presently known as Kasabe. Kasabe of earlier days was destroyed completely by Murar Jagdeo commanding the Adil Shahi force in the year 1630. It was during Shivaji Maharaj time the city was recreated with Kasabe Pune. With Kasabe Ganapati temple and Lal Mahal for his mother to reside Pune once again became habitable. Real development of Pune started once Bajirao Peshwe settled down with Pune as his headquarter of administration. New areas were developed and were known as Peth. Peth is basically a business location. [We could see that even Bangalore was developed with many Pet.] New peth were either named after the person who had developed it or it was called by the name of a day of the week. As per the historians there existed a Puneshwar Shiva temple along the banks of the river Mutha in Pune. Along with Puneshwar there existed another temple named Narayaneshwar. In the late thirteenth century Puneshwar temple was pulled down and converted into a dargah now called Younger Sheikh Salla Dargah, which stands in its place to this day. This place might have got the name Pune from Puneshwar. Raste Peth is a familiar location in Pune. It is at a walkable distance from the Pune Railway station. The King Edward Memorial Hospital is one of the famous health centers of the city. This location was developed by the Raste family. This is the surname of a family which was an important feudal family from the Maratha Empire. Their original surname was Gokhale. They earned the Raste title which means one who displays fairness [in Marathi], from the Bijapur monarchy for their integrity and honesty. Rasta peth a locality of Pune originally called Shivpuri Peth, was founded by and named after the family. Raste assisted the Peshwa in their Gujarat, Malwa and Karnataka military campaigns. Rastes built several Temples, Ghats, Palaces in Wai and Pune. Their family house in Pune, the Raste Wada, was built by Thorale Madhavrao the son of Nanasaheb, between 1779 and 1784 and later given to Rastes. Raste Wada located in Rasta Peth of Pune is one of the largest remaining Wadas. Rastes’ had maintained a cavalry that included camels [camelry] and horses. Their force included people from all faith and belief. They had built many temples for worship. While many temples were built near the Raste Wada there were few built by the troop where they had camped. One such temple built by the men of camelry is very famous today. 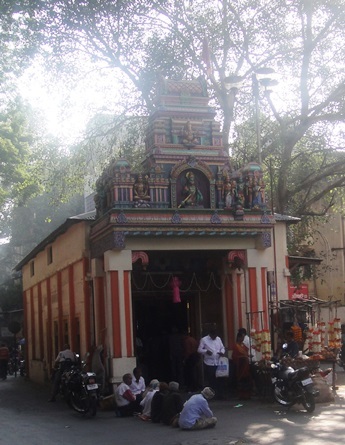 The mandir is right in the center of the Sardar Moodliar road [in Google map it is Mudaliar road]. Moodliars are popular people of Pune and Sardar Moodliar is the person who had donated land for KEM hospital way back in 1912. Right in the northern entrance of the Raste path is the temple for Sri Maruti, the guardian of Raste path. It is believed that the camelry force of Rastes’ were staying hear and established Sri Maruti here for worship. Today it has become Untade Maruti Unt [उंट] in Marathi means camal. Sri Maruti established by the Rastes’ camel cavalry is now fairly a big temple. Over the time many devotees of Sri Maruti had contributed their might and had developed the mandir. Today this temple is managed by a committee of locals. All festivals are celebrated with gay and gaiety. The murthi of Sri Maruti is about nine feet tall. Sri Maruti is facing west. Lord is seen kneeling with His right knee resting on the ground. Lords’ left leg is folded with His lotus left feet firm on the ground. 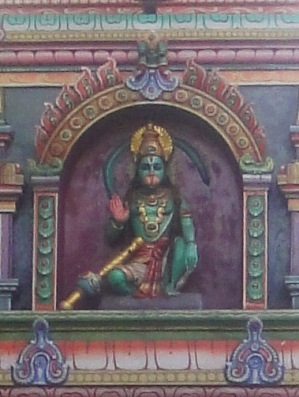 Lords left hand is resting on the left knee of the Lord and showing ‘Apana Mudra’. With His right hand with ‘Abhaya Mudra’ Lord is giving ‘Abhaya’, don’t be afraid - I am here to protect you. Lords’ tail is resting near His left feet with a small curve. Lords’ alluring radiant eyes are bestowing blessings to His devotees. Location of the temple : "Untade Maruti Mandir"
Just standing in front of the Lord and looking at Lords’ glowing eyes and praying will surely make the best of His devotees to come to fore and take him to new heights.